Pink noise or ​1⁄f noise is a signal or process with a frequency spectrum such that the power spectral density (energy or power per frequency interval) is inversely proportional to the frequency of the signal. Pink noise is the most common signal in biological systems. In pink noise, each octave (halving/doubling in frequency) carries an equal amount of noise energy. The name arises from the pink appearance of visible light with this power spectrum. This is in contrast with white noise which has equal intensity per frequency interval. where f is frequency, and 0 < α < 2, with exponent α usually close to 1. These pink-like noises occur widely in nature and are a source of considerable interest in many fields. The distinction between the noises with α near 1 and those with a broad range of α approximately corresponds to a much more basic distinction. The former (narrow sense) generally come from condensed-matter systems in quasi-equilibrium, as discussed below. The latter (broader sense) generally correspond to a wide range of non-equilibrium driven dynamical systems. Spectrum of a pink noise approximation on a log-log plot. 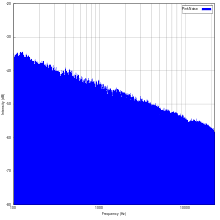 Power density falls off at 10 dB/decade of frequency. 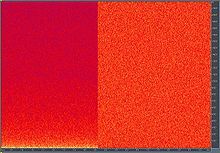 Relative intensity of pink noise (left) and white noise (right) on an FFT spectrogram with the vertical axis being linear frequency. The human auditory system, which processes frequencies in a roughly logarithmic fashion approximated by the Bark scale, does not perceive different frequencies with equal sensitivity; signals around 1–4 kHz sound loudest for a given intensity. However, humans still differentiate between white noise and pink noise with ease. Graphic equalizers also divide signals into bands logarithmically and report power by octaves; audio engineers put pink noise through a system to test whether it has a flat frequency response in the spectrum of interest. Systems that do not have a flat response can be equalized by creating an inverse filter using a graphic equalizer. Because pink noise has a tendency to occur in natural physical systems, it is often useful in audio production. Pink noise can be processed, filtered, and/or effects can be added to produce desired sounds. Pink-noise generators are commercially available. One parameter of noise, the peak versus average energy contents, or crest factor, is important for testing purposes, such as for audio power amplifier and loudspeaker capabilities because the signal power is a direct function of the crest factor. Various crest factors of pink noise can be used in simulations of various levels of dynamic range compression in music signals. On some digital pink-noise generators the crest factor can be specified. The power spectrum of pink noise is 1/f only for one-dimensional signals. For two-dimensional signals (e.g., images) the power spectrum is reciprocal to f 2 In general, in an n-dimensional system, the power spectrum is reciprocal to f n. For higher-dimensional signals it is still true (by definition) that each octave carries an equal amount of noise power. The frequency spectrum of two-dimensional signals, for instance, is also two-dimensional, and the area of the power spectrum covered by succeeding octaves is four times as large. In the past quarter century, pink noise has been discovered in the statistical fluctuations of an extraordinarily diverse number of physical and biological systems (Press, 1978; see articles in Handel & Chung, 1993, and references therein). Examples of its occurrence include fluctuations in tide and river heights, quasar light emissions, heart beat, firings of single neurons, and resistivity in solid-state electronics. An accessible introduction to the significance of pink noise is one given by Martin Gardner (1978) in his Scientific American column "Mathematical Games". In this column, Gardner asked for the sense in which music imitates nature. Sounds in nature are not musical in that they tend to be either too repetitive (bird song, insect noises) or too chaotic (ocean surf, wind in trees, and so forth). The answer to this question was given in a statistical sense by Voss and Clarke (1975, 1978), who showed that pitch and loudness fluctuations in speech and music are pink noises. So music is like tides not in terms of how tides sound, but in how tide heights vary. Because pink noise occurs in many physical, biological and economic systems, some researchers describe it as being ubiquitous. In physical systems, it is present in some meteorological data series, the electromagnetic radiation output of some astronomical bodies, and in almost all electronic devices (referred to as flicker noise). In biological systems, it is present in, for example, heart beat rhythms, neural activity, and the statistics of DNA sequences, as a generalized pattern. In financial systems, it is often referred to as a long-term memory effect[specify]. Also, it describes the statistical structure of many natural images. Recently, pink noise has also been successfully applied to the modeling of mental states in psychology, and used to explain stylistic variations in music from different cultures and historic periods. Richard F. Voss and J. Clarke claim that almost all musical melodies, when each successive note is plotted on a scale of pitches, will tend towards a pink noise spectrum. Similarly, a generally pink distribution pattern has been observed in film shot length by researcher James E. Cutting of Cornell University, in the study of 150 popular movies released from 1935 to 2005. Pink noise has also been found to be endemic in human response. Gilden et al. (1995) found extremely pure examples of this noise in the time series formed upon iterated production of temporal and spatial intervals. Later, Gilden (1997) and Gilden (2001) found that time series formed from reaction time measurement and from iterated two-alternative forced choice also produced pink noises. There is no known lower bound to background pink noise in electronics. Measurements made down to 10−6 Hz (taking several weeks) have not shown a ceasing of pink-noise behaviour. A pioneering researcher in this field was Aldert van der Ziel. A pink-noise source is sometimes deliberately included on analog synthesizers (although a white-noise source is more common), both as a useful audio sound source for further processing and as a source of random control voltages for controlling other parts of the synthesizer. Noise curves for a selection of gravitational-wave detectors as a function of frequency. 1/f noise is a factor in gravitational-wave astronomy. 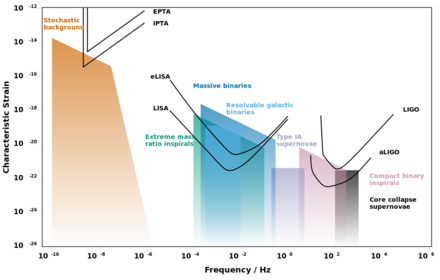 The noise curve at very low frequencies affect pulsar timing arrays, the European Pulsar Timing Array (EPTA) and the future International Pulsar Timing Array (IPTA); at low frequencies are space-borne detectors, the formerly proposed Laser Interferometer Space Antenna (LISA) and the currently proposed evolved Laser Interferometer Space Antenna (eLISA), and at high frequencies are ground-based detectors, the initial Laser Interferometer Gravitational-Wave Observatory (LIGO) and its advanced configuration (aLIGO). The characteristic strain of potential astrophysical sources are also shown. To be detectable the characteristic strain of a signal must be above the noise curve. It has been suggested that pink noise on timescales of decades, amplifies and couples climate processes in the climate system. There are many theories of the origin of pink noise. Some theories attempt to be universal, while others are applicable to only a certain type of material, such as semiconductors. Universal theories of pink noise remain a matter of current research interest. A hypothesis (referred to as the Tweedie hypothesis) has been proposed to explain the genesis of pink noise on the basis of a mathematical convergence theorem related to the central limit theorem of statistics. The Tweedie convergence theorem describes the convergence of certain statistical processes towards a family of statistical models known as the Tweedie distributions. These distributions are characterized by a variance to mean power law, that have been variously identified in the ecological literature as Taylor's law and in the physics literature as fluctuation scaling. When this variance to mean power law is demonstrated by the method of expanding enumerative bins this implies the presence of pink noise, and vice versa. Both of these effects can be shown to be the consequence of mathematical convergence such as how certain kinds of data will converge towards the normal distribution under the central limit theorem. This hypothesis also provides for an alternative paradigm to explain power law manifestations that have been attributed to self-organized criticality. There are various mathematical models to create pink noise. Although self-organised criticality has been able to reproduce pink noise in sandpile models, these do not have a Gaussian distribution or other expected statistical qualities. It can be generated on computer, for example, by filtering white noise, inverse Fourier transform, or by multirate variants on standard white noise generation . In supersymmetric theory of stochastics, an approximation-free theory of stochastic differential equations, 1/f noise is one of the manifestations of the spontaneous breakdown of topological supersymmetry. This supersymmetry is an intrinsic property of all stochastic differential equations and its meaning is the preservation of the continuity of the phase space by continuous time dynamics. Spontaneous breakdown of this supersymmetry is the stochastic generalization of the concept of deterministic chaos, whereas the associated emergence of the long-term dynamical memory or order, i.e., 1/f and crackling noises, the Butterfly effect etc., is the consequence of the Goldstone theorem in the application to the spontaneously broken topological supersymmetry. ^ Szendro, P (2001). "Pink-Noise Behaviour of Biosystems". European Biophysics Journal. 30 (3): 227–231. doi:10.1007/s002490100143. ^ Downey, Allen (2012). Think Complexity. O'Reilly Media. p. 79. ISBN 978-1-4493-1463-7. Visible light with this power spectrum looks pink, hence the name. ^ a b Kogan, Shulim (1996). Electronic Noise and Fluctuations in Solids. [Cambridge University Press]. ISBN 978-0-521-46034-7. ^ Press, W. H. (1978). "Flicker noises in astronomy and elsewhere". Comments in Astrophysics. 7 (4): 103–119. ^ a b Gardner, M. (1978). "Mathematical Games—White and brown music, fractal curves and one-over-f fluctuations". Scientific American. 238 (4): 16–32. doi:10.1038/scientificamerican0478-16. ^ Josephson, Brian D. (1995). "A trans-human source of music?" in (P. Pylkkänen and P. Pylkkö, eds.) New Directions in Cognitive Science, Finnish Artificial Intelligence Society, Helsinki; pp. 280–285. ^ Field, D. J. (1987). "Relations between the statistics of natural images and the response properties of cortical cells" (PDF). J. Opt. Soc. Am. A. 4 (12): 2379–2394. Bibcode:1987JOSAA...4.2379F. CiteSeerX 10.1.1.136.1345. doi:10.1364/JOSAA.4.002379. PMID 3430225. ^ Pareyon, G. (2011). On Musical Self-Similarity, International Semiotics Institute & University of Helsinki. "On Musical Self-Similarity" (PDF). ^ Gilden, D. L. (1997). "Fluctuations in the time required for elementary decisions". Psychological Science. 8 (4): 296–301. doi:10.1111/j.1467-9280.1997.tb00441.x. ^ Gilden, David L (2001). "Cognitive Emissions of 1/ƒ Noise". Psychological Review. 108 (1): 33–56. CiteSeerX 10.1.1.136.1992. doi:10.1037/0033-295X.108.1.33. ISSN 0033-295X. ^ Weissman, M. B. (1988). "1/ƒ Noise and other slow non-exponential kinetics in condensed matter". Reviews of Modern Physics. 60 (2): 537–571. Bibcode:1988RvMP...60..537W. doi:10.1103/RevModPhys.60.537. ^ Dutta, P. & Horn, P. M. (1981). "Low-frequency fluctuations in solids: 1/f noise". Reviews of Modern Physics. 53 (3): 497–516. Bibcode:1981RvMP...53..497D. doi:10.1103/RevModPhys.53.497. ^ Kleinpenning, T. G. M. & de Kuijper, A. H. (1988). "Relation between variance and sample duration of 1/f Noise signals". Journal of Applied Physics. 63 (1): 43. Bibcode:1988JAP....63...43K. doi:10.1063/1.340460. ^ Jim Shelton (2018-09-04). "Think pink for a better view of climate change". YaleNews. Retrieved 5 September 2018. ^ Jørgensen, B; Martinez, JR; Tsao, M (1994). "Asymptotic behaviour of the variance function". Scand J Statist. 21: 223–243. ^ Kendal, WS (2015). "Self-organized criticality attributed to a central limit-like convergence effect". Physica A. 421: 141–150. Bibcode:2015PhyA..421..141K. doi:10.1016/j.physa.2014.11.035. ^ Milotti, Edoardo (2002-04-12). "1/f noise: a pedagogical review". arXiv:physics/0204033. Bibcode:2002physics...4033M. ^ O’Brien, Kevin P.; Weissman, M. B. (1992-10-01). "Statistical signatures of self-organization". Physical Review A. 46 (8): R4475–R4478. Bibcode:1992PhRvA..46.4475O. doi:10.1103/PhysRevA.46.R4475. ^ "Noise in Man-generated Images and Sound". mlab.uiah.fi. Retrieved 2015-11-14. ^ "DSP Generation of Pink Noise". www.firstpr.com.au. Retrieved 2015-11-14. ^ McClain, D (May 1, 2001). "Numerical Simulation of Pink Noise" (PDF). Preprint. Archived from the original (PDF) on 2011-10-04. ^ Timmer, J.; König, M. (1995-01-01). "On Generating Power Law Noise". Astronomy and Astrophysics. 300: 707–710. Bibcode:1995A&A...300..707T. ^ Ovchinnikov, I.V. (2016). "Introduction to supersymmetric theory of stochastics". Entropy. 18 (4): 108. arXiv:1511.03393. Bibcode:2016Entrp..18..108O. doi:10.3390/e18040108. ^ Ovchinnikov, I.V. ; Schwartz, R. N.; Wang, K. L. (2016). "Topological supersymmetry breaking: Definition and stochastic generalization of chaos and the limit of applicability of statistics". Modern Physics Letters B. 30 (8): 1650086. arXiv:1404.4076. doi:10.1142/S021798491650086X. Dutta, P. & Horn, P. M. (1981). "Low-frequency fluctuations in solids: 1/ƒ noise". Reviews of Modern Physics. 53 (3): 497–516. Bibcode:1981RvMP...53..497D. doi:10.1103/RevModPhys.53.497. Field, D. J. (1987). "Relations Between the Statistics of Natural Images and the Response Profiles of Cortical Cells" (PDF). Journal of the Optical Society of America A. 4 (12): 2379–2394. Bibcode:1987JOSAA...4.2379F. CiteSeerX 10.1.1.136.1345. doi:10.1364/JOSAA.4.002379. PMID 3430225. Gisiger, T. (2001). "Scale invariance in biology: coincidence or footprint of a universal mechanism?". Biological Reviews. 76 (2): 161–209. CiteSeerX 10.1.1.24.4883. doi:10.1017/S1464793101005607. Johnson, J. B. (1925). "The Schottky effect in low frequency circuits". Physical Review. 26 (1): 71–85. Bibcode:1925PhRv...26...71J. doi:10.1103/PhysRev.26.71. Kogan, Shulim (1996). Electronic Noise and Fluctuations in Solids. [Cambridge University Press]. ISBN 978-0-521-46034-7. Press, W. H. (1978). "Flicker noises in astronomy and elsewhere" (PDF). Comments on Astrophysics. 7 (4): 103–119. Bibcode:1978ComAp...7..103P. Schottky, W. (1918). "Über spontane Stromschwankungen in verschiedenen Elektrizitätsleitern". Annalen der Physik. 362 (23): 541–567. Bibcode:1918AnP...362..541S. doi:10.1002/andp.19183622304. Schottky, W. (1922). "Zur Berechnung und Beurteilung des Schroteffektes". Annalen der Physik. 373 (10): 157–176. Bibcode:1922AnP...373..157S. doi:10.1002/andp.19223731007. Keshner, M. S. (1982). "1/ƒ noise". Proceedings of the IEEE. 70 (3): 212–218. doi:10.1109/PROC.1982.12282. Li, W. (1996). "A bibliography on 1/ƒ noise".